According to many authorities the impact of humanity on the earth is already overshooting the earth’s capacity to supply humanity’s needs. This is an unsustainable position. 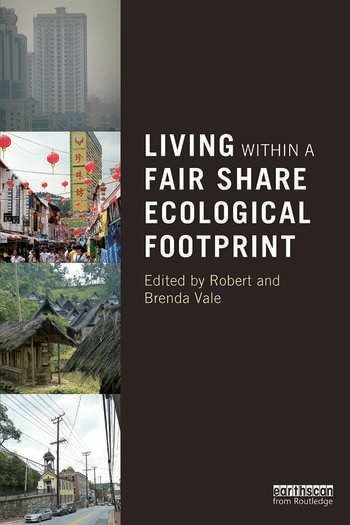 This book does not focus on the problem but on the solution, by showing what it is like to live within a fair earth share ecological footprint. The authors describe numerical methods used to calculate this, concentrating on low or no cost behaviour change, rather than on potentially expensive technological innovation. They show what people need to do now in regions where their current lifestyle means they are living beyond their ecological means, such as in Europe, North America and Australasia. The calculations focus on outcomes rather than on detailed discussion of the methods used. The main objective is to show that living with a reduced ecological footprint is both possible and not so very different from the way most people currently live in the west. The book clearly demonstrates that change in behaviour now will avoid some very challenging problems in the future. The emphasis is on workable, practical and sustainable solutions based on quantified research, rather than on generalities about overall problems facing humanity. Part 2: What does Living within a Fair Earth Share Mean? Robert and Brenda Vale are Professorial Research Fellows in the School of Architecture, Victoria University of Wellington, New Zealand. They share common research interests in ecological footprinting and sustainable building design, and are both currently working on the new Foundation for Research, Science and Technology (FRST) project to deliver ecological footprinting and systems approaches to sustainable development of communities.